Riesling is used to make dry, semi-sweet, sweet and sparkling wines. In wine making, the delicate nature of the Riesling grape requires careful handling during harvesting to avoid crushing or bruising the skin. Without this care, the broken skins could release tannin into the juice, giving it a markedly bitter taste and disrupting the wine’s balance. 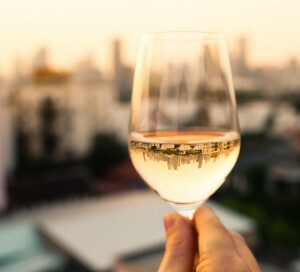 To preserve the fresh quality of Riesling, grapes and juice may be chilled throughout the vinification process: immediately following harvest to preserve the grapes’ more delicate flavors, after the juice has been processed through a press and right before fermentation. During fermentation, the wine is usually kept cool in temperature-controlled stainless steel tanks kept between 50-65°F (10-18°C). This differs markedly from red wine fermentations which normally attain temperatures of 75-85°F (24-29°C). Unlike Chardonnays, most Rieslings are not permitted to undergo malolactic fermentation. This helps to preserve the tart, acidic characteristic of the wine, giving Riesling its bright, vibrant quality and not introducing any extraneous or distracting buttery aromas. Riesling is often put through a process of cold stabilization, where the wine is stored just above its freezing point. The wine is kept at this temperature until much of the potassium bitartrate (the acid salt of tartaric acid) has precipitated out of the wine. This helps prevent crystallization of the bitartrates (often called “wine diamonds”) in the bottle. After this, the wine is normally filtered to remove any remaining yeast or impurities. In order to avoid re-fermentation in the bottle, most Rieslings are sterile filtered because they contain residual malic acid and residual sugar.